Since 1988, State Theatre New Jersey has introduced nearly a half-million students and teachers to the performing arts, both at the theater and in the classroom. Our comprehensive programs for schools deeply enrich students’ learning and infuse creativity across the curriculum. State Theatre New Jersey’s Performances for Schools offer students memorable encounters with innovative, exciting, and inspiring live music, dance, and theater from around the world. 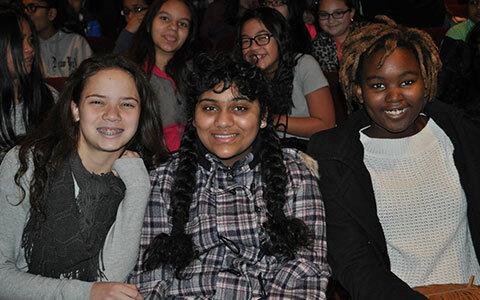 Symphony Scholars leads students on an in-depth exploration of classical music, including attending a live orchestra concert at the State Theatre New Jersey. A catalyst for creativity, State Theatre New Jersey's Professional Development Workshops for Teachers are a hands-on learning experience, offering teachers effective, classroom-friendly strategies for integrating the arts into the curriculum. State Theatre New Jersey loves educators! Check out our Educator Appreciation page for special events and discounts just for teachers. *Discounts are not retroactive and cannot be combined with other offers or Rewards. Additional fees and restrictions may apply. "The State Theatre is a magical experience for teachers and students alike. Few theaters come close to your commitment to children and their education. Having students come back from the theater energized, spellbound, wild with enthusiasm, is what education should be all about."